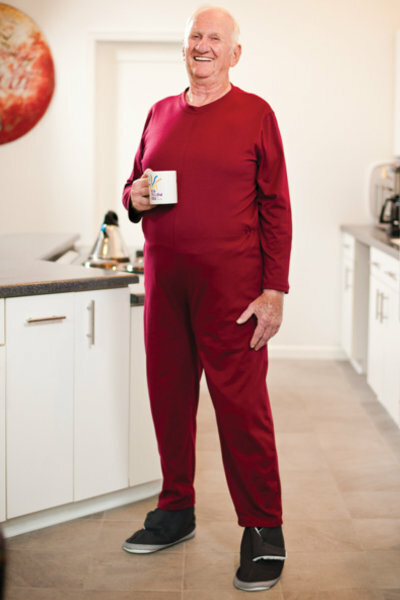 Our back opening sleeper jumpsuit is perfect for the advanced dementia or Alzheimer's patient with the chronic urge to undress. This jumpsuit features a long, reinforced back zipper with a snap closure at the back of the neck for added security. Cozy cotton/polyester jersey knit ensures no binding when sleeping. Long or short sleeves available. Assorted solid colors. Back opening sleeper jumpsuit is available in both Long Sleeve (LS) and Short Sleeve (SS). Please specify either 'LS' or 'SS' in Color Preferences/Notes section above when ordering.